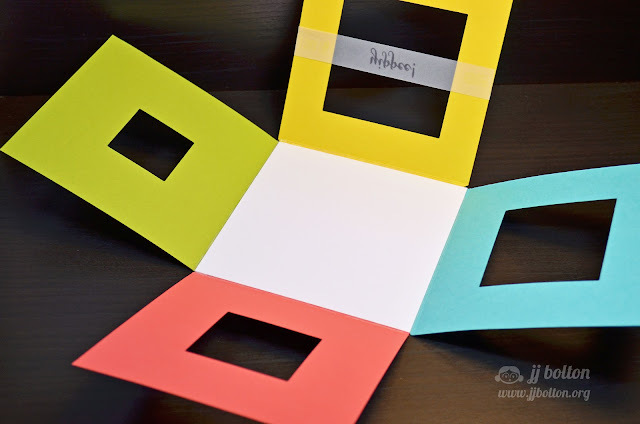 The card was assembled from 5 different pieces cardstock. 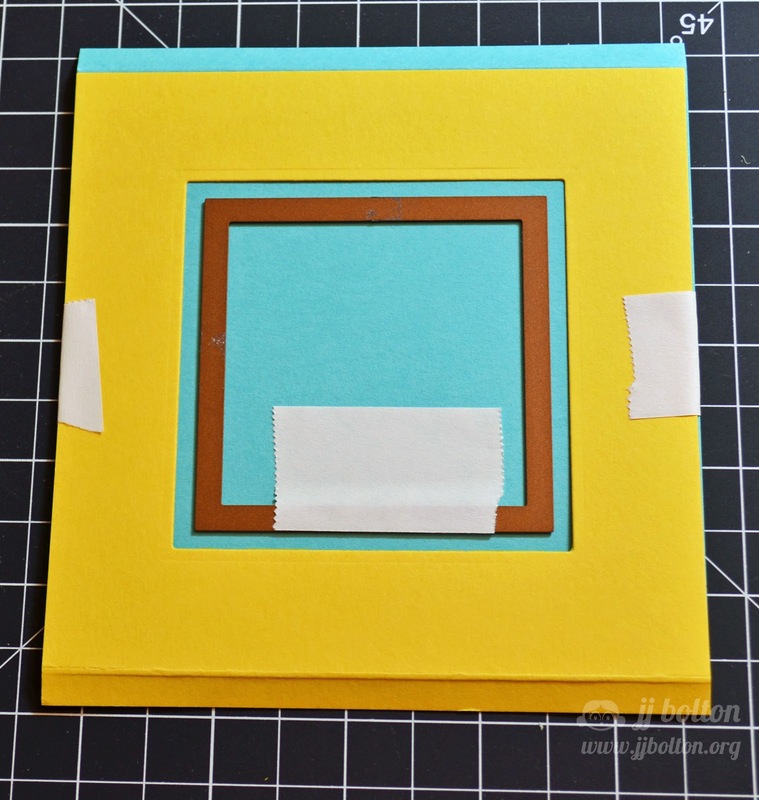 The white base measures 5"X5" and the colored pieces measure 5" X 5-1/4". The extra 1/2" is used as a tab to adhere the flap to the white base. Starting from the outermost flap, I cut the largest square. 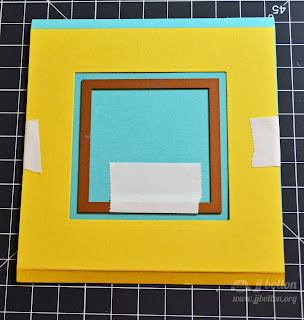 I used that die cut to center the next layer and so on until all 4 layers were cut. Here you can see the 4 layers cut out and ready to be attached to the white card base. Each folded tab is adhered to the white base using narrow scoretape onto the 4 sides of the card base. Thanks so much to everyone for playing along! It's been a blast checking out everyone's cards! This card is so pretty--but when you open it up--yowza--the coolest ever. How am I ever going to case this one? You are amazing! Your new card is so cool! What a cool card! Totally amazing. I wonder how many tries it will take me to CASE your card. Yipee!!! 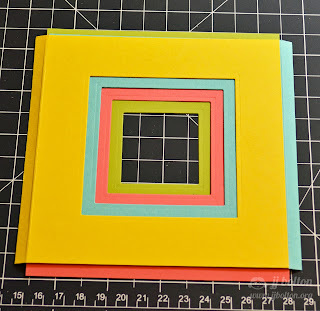 I love all of that colorful cardstock! Fabulous design! wow, I love this card, especially the way it opens up! This is so cool! LOVE how it explodes! AH! MATH! This is FABULOUS, JJ!! Love how it explodes - and how awesome is YIPPEE for this card? Too cool! Awesome, amazing, genius! You are just so amazingly creative! Ummm, you are amazing! Aside from the obvious really cool stuff, I LOVE how the "yipee" is floating in the center on vellum! PS, the inspiration card is still one of my all time favorites. I remember the first time I saw it ... I was new to the blog world and thought "holy cow, I had no idea people are making things like this!" So blown away. An amazing card. Thanks for sharing - bet the person who received it loved it! So cool. Such a JJ card! Oh my, JJ, this is so very clever with beautiful results. 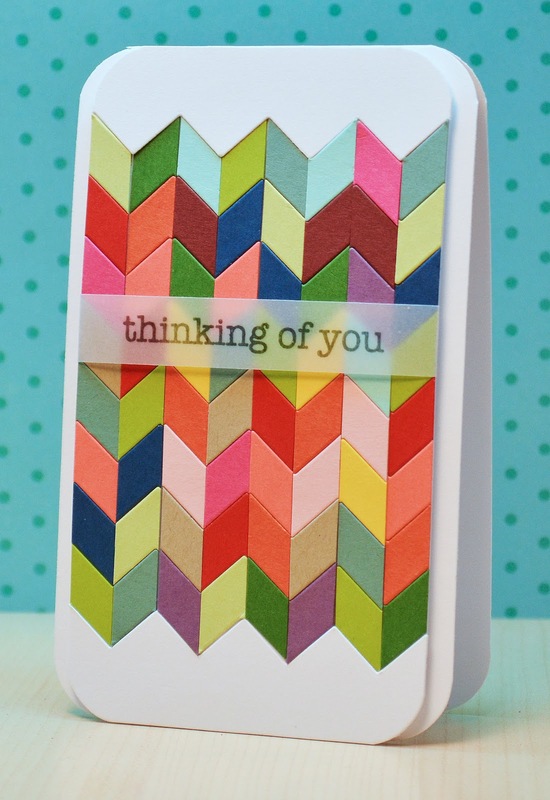 Must admit though, your chevron "thinking of you" card above is still my very favorite…but take no offense. Oh I just lurve your fold out card - how clever and what stunning colours! OMG JJ!! Are you serious?!! Probably makes perfect sense to that scientific mind of yours - crazy good! 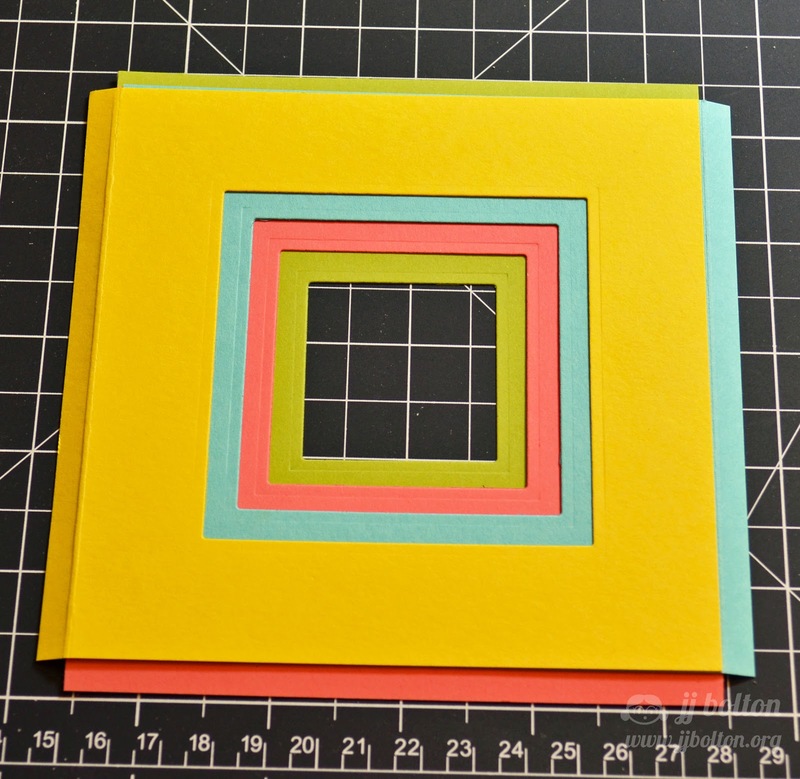 Gorgeous card JJ, and a fantastic tutorial! So signature you! Oh wow... what an amazing card and tutorial.